It was like being in a Thomas Cole painting, surrounded by the ancient mountains full of trees flaunting spectacular shades of yellow, orange and occasionally, a startling bright red, despite an overcast sky. As one of seven passengers seated comfortably in a large van less than 100 miles from New York City, my spirit was being restored. 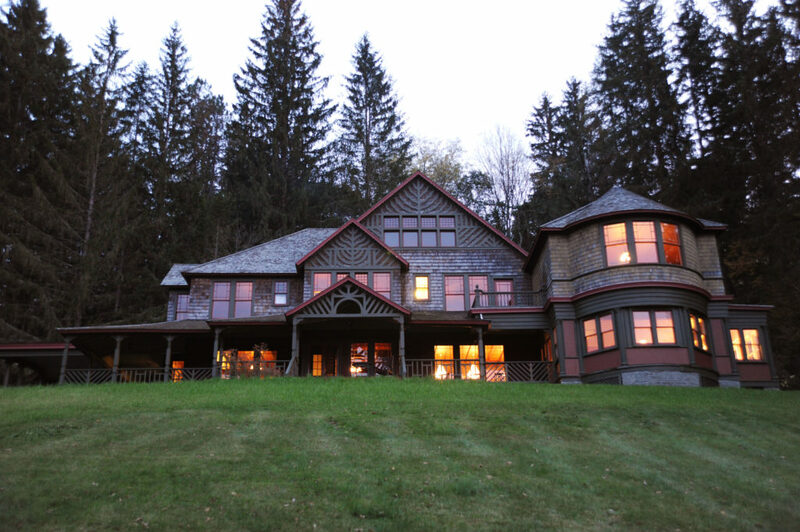 This Catskills weekend, Forage Your Feast, was partnered by Spillian, a repurposed historic mansion whose name means to revel (more about that later) and Table to Farm Tours, operated by Kevin DePodwin and Lindsay Barton who work with more than 45 area farmers, cheesemakers, and distillers, providing day trips. Today we are visiting five of them. 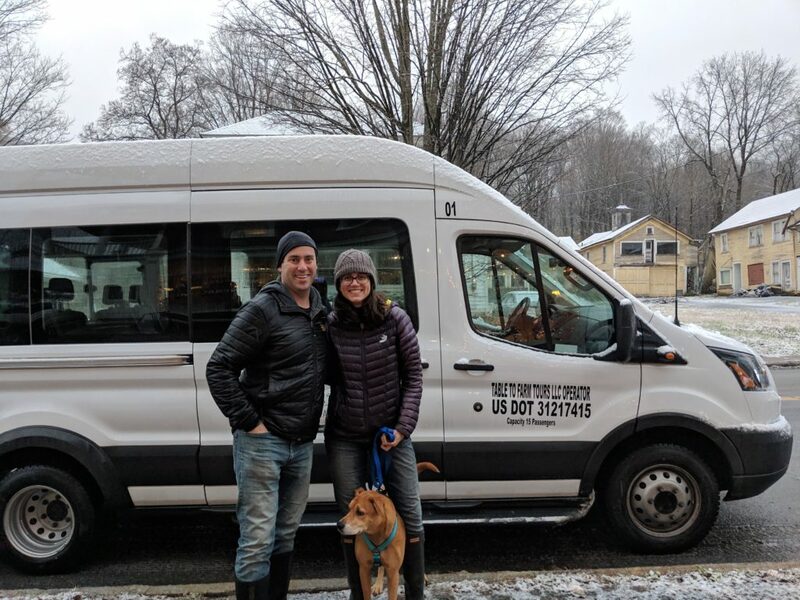 Kevin and Lindsay themselves, left New York City jobs to begin this business in an area Kevin has loved since childhood summer visits with relatives. So we sit back and relax and enjoy the vista and meet the people who are doing the important things that give our lives sustenance. 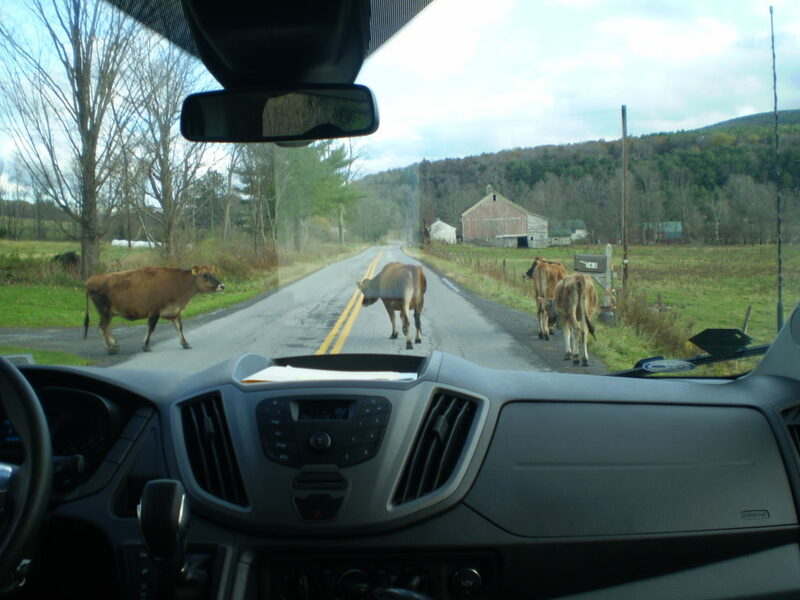 And if a few cows happen to wander into the road, well, they will soon be on their way. Animals are respected here and one of the stories Lindsay tells us as we travel is that Walter Brooks, the creator of the famous TV series, Mr. Ed, the talking horse, grew up nearby. The Catskills is a series of 98 mountains over 3,000 feet tall blanketed with beech, hemlock, oak, and maple trees. At Buck Hill Farm in Jefferson, hoses carry the sap from the maples into the small brick building where it is processed into syrup. In 1993 Sharon Buck and her husband Jeff Collins took over the farm begun in 1978 by Sharon’s parents, Charles and Lynn Buck. We watched Sharon at a machine turning syrup into miniature candy figures of a man and woman to be packaged together in cellophane. They also create pairs of men as well as women couples. The farm produces maple butter, maple ketchup, and more, which they sell regionally and in the farmer’s markets. Every Sunday pancake breakfast is available to the community. Apple trees are abundant and Burr Hubbell welcomed us to his sprawling family farm operating since the 1840s in Margaretville, to watch apple cider being made. Local people had arrived with crates of apples which were then rolled down a shoot into the original press that crushes and then presses them into liquid. An adjacent1870s sawmill still cuts lumber, but this farm is primarily home to free range cows, pigs, chickens, and goats. A shop next to the cider press carries a variety of farm equipment, unrecognizable to city dwellers, but on the wall near the entry is the head of the late Augie, a once beloved member of the herd. 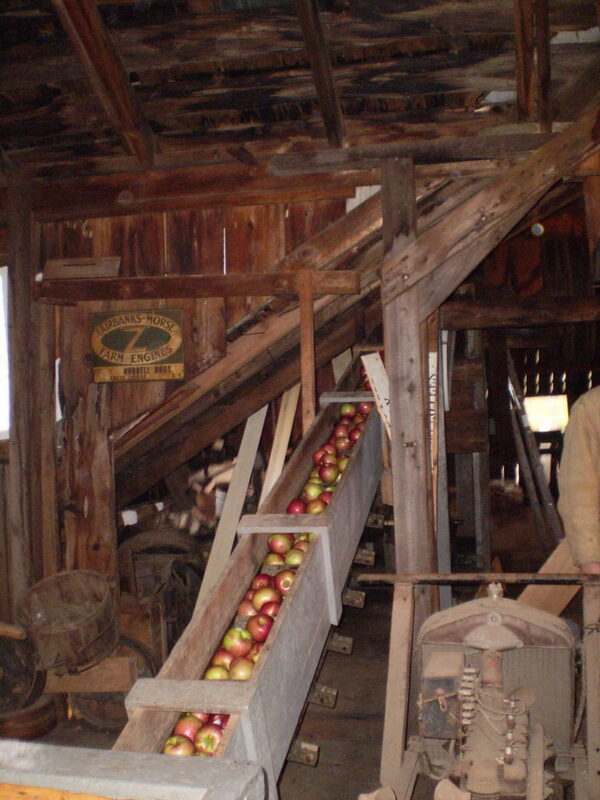 In pioneer days fermented cider was the cheapest and easiest way to get a good stiff drink. Hard cider is seeing a rebirth and today’s producers use more adjectives than wine aficionados to describe their products. In West Fulton, we stop for a tasting at Scrumpy Ewe Cider Shack. Ryan McGiven chose the name from the unfiltered farm house cider he discovered while working as a musician in Europe. He has developed several types of cider with names like Newtown Spy, Farmhouse Dry, Stonecutter and Old Lunkie. Another long-time family operation is Barber Farms in Middleburgh, where they grow everything from asparagus to watermelon including 12 kinds of lettuce and more recently what they call their farm to table 1857 Vodka, named for the year the farm began. You can also sample some vodka varieties at their nearby farm stand, which operates daily from June to December and weekends other times. The farm stand will introduce you to some squash varieties you may not have seen before, as well as giant stalks of Brussels sprouts. 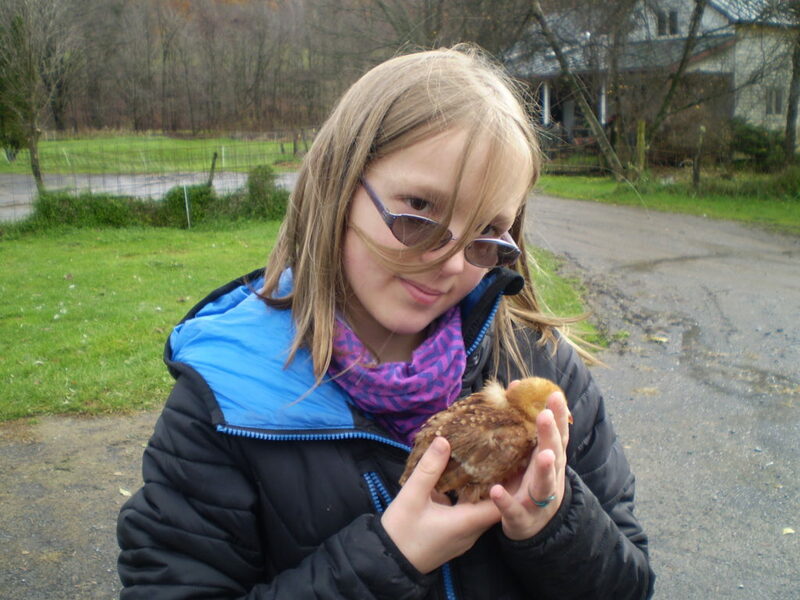 Eleven-year old Ula Hayes Hooper, was waiting for us as Kevin pulled the van into the Sap Bush Hollow Farm in West Fulton. As we piled out, she revealed a tiny chick she had been keeping warm inside her jacket collar. Behind Ula a very noisy goose flapped its wings bossing two other geese to retreat and leave him alone. Ulla’s grandparents Jim and Adele Hayes, raise sheep, turkeys, and pigs with the help of their daughter Shannon and her husband, Bob Hooper. They produce wool, and a new supply of handmade blankets was available in their nearby Farm Store and Café. Ula’s mom, writes The Radical Homemaker blog and operates the farm’s restaurant where we enjoyed a hearty lunch of local beef curry and mixed berry pie. After our farm visits and tastings, we headed back to Spillian, the 1880s summer home of the Charles Louis Fleischmann family, of yeast and whiskey fame. Like many early Jewish families, the Fleischmann’s, were shunned elsewhere, but welcomed in the Catskills, which became known as the Borscht Belt. 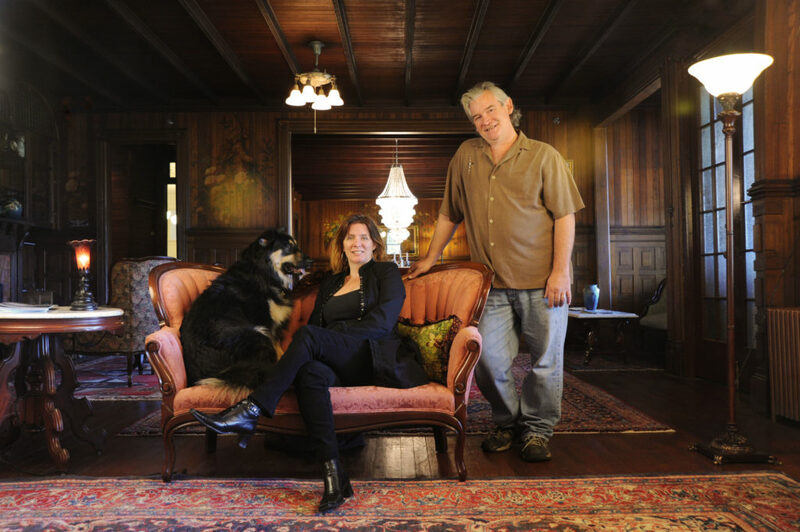 The property had been empty for 20 years when Leigh Melander and her husband and business partner Mark Somerfield, bought and restored it six years ago and named it with an old English word meaning to play. Melander, who has a PhD in cultural mythology and psychology, oversees the events with creative people from around the world. Somerfield, MFA, a scenic lighting designer for opera, theatre, and ballet internationally, designed the restoration and shares management with Leigh. Each of the mansion’s eight bedrooms has its own theme. I had the Camelot Room with a suit of shining armor standing near the door. Books on the night table such as, Eleanor of Aquitaine, compliment the theme and offer a needed respite from television, which you won’t find here. A 12-course menu prepared by Chef Christian van Ettin began with an autumn salad of local julienned apple, onion, beets and goat cheese. Then came a wonderful house-made butternut squash tortolloni with brown butter flavored with crushed pine needles. A Catskills take on coq au vin with hard cider and mushrooms followed and after two more courses the feast ended with apple tart and celeriac ice cream. Van Etten first chose to study landscape architecture at college. Along the way he worked in restaurants and realized, that’s where his heart was, so finished his education in culinary school. His chef influences include David Chang and Thomas Keller. The next morning, before everyone headed home, Chef gave us a cooking class in the tortolloni. 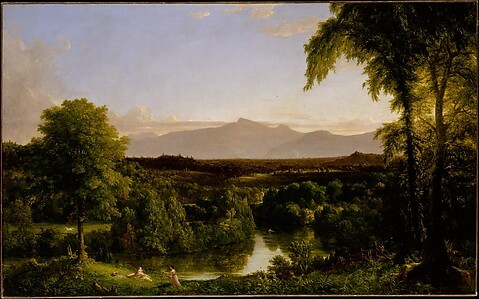 As I left, reluctantly, I thought of Thomas Cole’s “View on the Catskills, Early Autumn,” painted in 1836 in response to the construction of the railroads into this environment. “The copper-hearted barbarians are cutting all the trees down in the beautiful valley on which I have looked often with a loving eye—this throws quite a gloom over my spring anticipations—tell this to Durant, not that I wish to give him pain, but that I want him to join with me in maledictions on all dollar-godded utilitarians.” I think Cole, who died in 1848 would be pleased to know every inch of his beloved Catskills has been protected by the New York state constitution since 1885 because he and other artists and writers made the area so beloved with their pictures and stories. 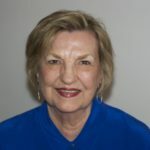 Marian Betancourt is a contributor to Everett Potter’s Travel Report and the author of Heroes of New York Harbor: Tales from the City’s Port (Globe Pequot Press).